November is often thought of as a time of thanks. It is a time in which many of us take a step back and consider all that we are grateful for in life – friendships, family, the warmth of a loving home. In all our gratitude, in all our indulgences, we become aware of the things in life that matter most to us. Just this year, Adoptions With Love celebrated our 30th anniversary as a licensed, Massachusetts adoption agency. This November, we are celebrating another big thirty: 30 days of love, gratitude, and adoption awareness. For those who do not know, November is also National Adoption Awareness Month. The history of National Adoption Month started over two decades ago and continues to evolve each year. This year, National Adoption Month is all about family, permanency, and lifelong relationships. In fact, the Children’s Bureau named this year’s theme, “We Never Outgrow the Need for Family.” Throughout the month of November, communities, organizations, and individuals around the country will be celebrating adoption as a positive way to build permanent families for children. They will be focusing on the value of lifelong homes for children and youth nationwide – especially those in foster care who are still waiting for a forever family. Making a private adoption plan is one way to prevent children from entering foster care. On the first day of November, we at Adoptions With Love have some particular thoughts resonating in our minds and hearts. We are thinking of all the courageous young women and men who have come to us over the last three decades to make an adoption plan for their child. We are thinking of all the incredible families built through adoption. We are also thinking of all the fervent adopted children who were placed through our agency, from thirty years ago to yesterday. Because November is a time of gratitude, we want to take a moment to thank all of you – all who have come to Adoptions With Love – for choosing adoption as a positive option for your family. If you are a birth parent, we thank you for being brave. We thank you for being selfless and for finding the power to make such a loving and thoughtful choice. We acknowledge that your decision was made with overwhelming love, that you gave your child a life beyond what you felt you could provide. Making an adoption plan for your child is not easy. It is a deep sacrifice that very few can understand. There are so many fears and emotions that can arise during the adoption process. We know that it takes great strength for a loving parent like you to overcome them. This strength is truly incomparable, and it amazes us every single day. We thank you for putting your trust in us. We are honored to be a part of your adoption journey. We thank you for choosing Adoptions With Love. If you are an adoptive parent, we thank you for being open-minded and open-hearted. There is no doubt that adoption is a challenging process, and we thank you for being such a devoted and compassionate support. We thank you for providing such a loving, stable and secure life for your child. We celebrate you for taking pride in your child’s adoption story and for empathizing with the selfless decision your child’s birth parents made. We thank you for choosing Adoptions With Love. If you are an adoptee, we especially celebrate you. We thank you for filling our hearts and the hearts of your family members. We thank you for sharing your stories with us over the years and for spreading awareness on adoption. We know that adoption has impacted your life and identity in many ways. We want you to know that you can always reach out to us, whether to chat or to learn about our search and reunion program. If you are considering adoption for your baby, we thank you for exploring your options and for thinking of your child’s best interest. Whether you just discovered you are pregnant, are in your final trimester, or have already given birth, we extend our support to you. It is never too late to make an adoption plan. If you are a waiting family hoping to grow your family through adoption, we thank you for your perseverance. Your determination and devotion are truly admirable as you wait for your time to enjoy all that goes with being a parent. We are excited to see what is in store for your family and are always here to help you through the adoption process. Let us celebrate these 30 days of love together. This November, we invite you to celebrate adoption and all those who have been touched by adoption in some way. We ask you to celebrate the families who were created through this choice as well as honor the women who found the courage to make this inspirational choice. We ask you to embrace the love inherent in each aspect of adoption. 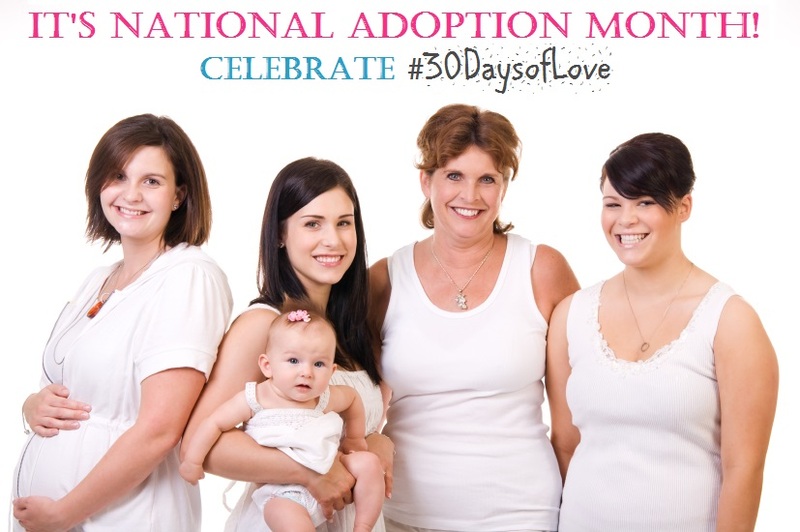 We invite you to celebrate all the lifelong connections that have been made through open adoption. National Adoption Awareness Month is a time to celebrate adoption as well as educate others on the adoption journey. It is about increasing awareness on the positive aspects of adoption. This month, we ask you to join us by sharing your own experience. We invite you to share your thoughts and stories in efforts to help others see the benefits of the adoption. If you would like more information on National Adoption Awareness Month or how you can get involved, contact us directly at 1-800-722-7731, text us at 617-777-0072, or email our team at info@awlonline.org.